I was honored to be a presenter at a number of conferences this year, mostly through the National Writing Project. I gave a keynote address out in Missouri on Writing in an Online World, and then worked with my good friend, Mary, on a presentation around digital books and stories for a writing assessment conference, and then presented on the writing process of digital storytelling with another NWP colleague at the NWP Annual Conference. In my role with the Western Massachusetts Writing Project, I even helped organize a Technology Across the Curriculum Conference at my school. I still find it hard to believe that people want to hear me talk. But I find that giving a presentation allows me to reflect a bit deeper on my own practices. 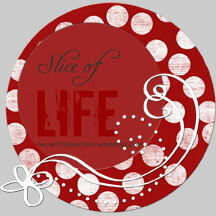 (See my workshop website). Meanwhile, the collaborations within those networks continues, as Bonnie and I have some grand plans for the coming year (crossing fingers on a possible grant) that will help keep teachers connected and engaged as writers and as professionals. My band, The Sofa Kings, continues to survive, but we are feeling a bit directionless right now. I wrote a faire number of songs this year for the band and for myself, and that part of my life — the creative process — remains very important to me. There is something special about writing a song for me — sometimes the threads just come together and it feels …. right. I was honored to have a song that I wrote become part of our church pageant, and even more honored when some folks there said they would like to use my song each Christmas Eve as part of the service where we all come together to light candles and hold hands and become a community. That is the power of song. I had hoped that this would be the year that The Sofa Kings would release our CD that we recorded last year, but that didn’t happen due to a number of reasons and those tracks (many of which I wrote or co-wrote) now sit in the digital dustbin, collecting … digital dust. I won’t forget them, however. But what to do with them remains a conundrum. I found Twitter this year and it has been … interesting. The quick writing suits me fine. I like to collect and shout in short bursts, I guess. But just as important, Twitter has tied me to many wonderful educators and others who share resources, connect with others and find ways to expand the concept of the learning networks that inform our teaching. The Day in a Sentence keeps on chugging along and I had much help this year — including much of the summer, when a host of folks took it over for me — in keeping it alive. There are now more than 100 folks on my Day in a Sentence email list, which amazes me, and I am always thankful for people who spend a moment to reflect and share out. (warning: a call for Year in a Sentence will be forthcoming). I often feel as if the Day in a Sentence has tentacles that reach out and connect people in different ways. I guess that is why they call it the Web, right? I moved into the visuals, too, with Bonnie’s very cool PhotoFridays adventure, which is a group on Flickr where folks are sharing photos and comments and elements that work in tandem with writing. I find myself thinking of the world in more visual terms as a result. Photography was never my strong suit, but digital cameras make many things possible as I explore angles and points of view. One of my projects is capturing a tree in our school playground through the seasons. So simple, and yet, I am finding it very powerful. And interesting. In the classroom, I keep moving forward with merging technology with writing in hopes that my students will become more engaged in what they are doing. This has included the Many Voices for Darfur Project, Youth Radio, the Longfellow Ten movie site, our own Electronic Pencil weblog and the exploration of tools that might allow them to move forward and in new directions. (See my posts about using Google Maps in conjunction with reading The Odyssey. Or go to the Heroic Journey site that we created). To all of you who stop here and read and comment — I thank you and I want to wish you: Happy New Year. Earlier this year, during the 24 Hour Comic event, I created a graphic novel about falling into an icy river and being saved by my brother (which I also wrote about for Memoir Mondays at one time). This week, as temperatures rose a bit, my sons and I have been taking a visiting dog (Bella, whose name was also that of our old dog) down to the river. There, I have watched as the older ones have discovered icebergs in the shallow parts of the water and it was as if I were seeing myself as a kid (without the near-death experience). They kicked, prodded, threw rocks, used sticks as wedges — anything to break the ice free. They imagined they could board the ice and float down the river. One mentioned the waterfall downstream. The sound was roaring off in the distance. “We’ll jump off the icebergs before we get to the waterfall,” the older one said, and that was that. No thoughts about the freezing temperatures of the water or the difficulty of swimming with winter clothes on. I could tell that they knew that these bits of ice would never hold their weight to begin with anyway. It was all about the imagination. One the other side of the river, away from the ice, my youngest son and I stood, watching. “When I get older, can I make icebergs?” he asked, as his brothers slipped around. I nodded my head “yes” and together, we both tossed large stones in the water, aiming to break up the ice chunks that had been set free by the older brothers. I opened up the latest edition of NEA Today magazine to find a two-page article about the use of comics and graphic novels in the classroom. I like how, more and more, these types of articles are appearing in mainstream educational magazines. The article here is layed out as a comic strip, with the character of Super-Teacher (ie, Jeff Miller from Stevensville Middle School in Maryland) showing how comics and graphic novels may help motivate young people into more reading, and thus, sharpening their skills. The article by Mary Ellen Flannery cites such works as Maus by Art Spiegelman and Two-fisted Science: Stories about Scientists by Jim Ottaviani as good resources. Also, they reference a site that I had not heard of before called No Flying No Tights, which may be worth a visit (leave your flying tights at home, though). I write reviews for The Graphic Classroom, where Chris Wilson explores and understands the appeal of comics and the power of the visual with writing to connect with students. For myself, I also try to think about how graphic novel formats might make sense for young writers, too. For some of my students, when you add an artistic element to an assignment, it opens them up to creative paths that they might not otherwise venture down. The article in NEA is not yet available online (they seem to run a month behind) but I hope you got a copy in your mailbox, too. 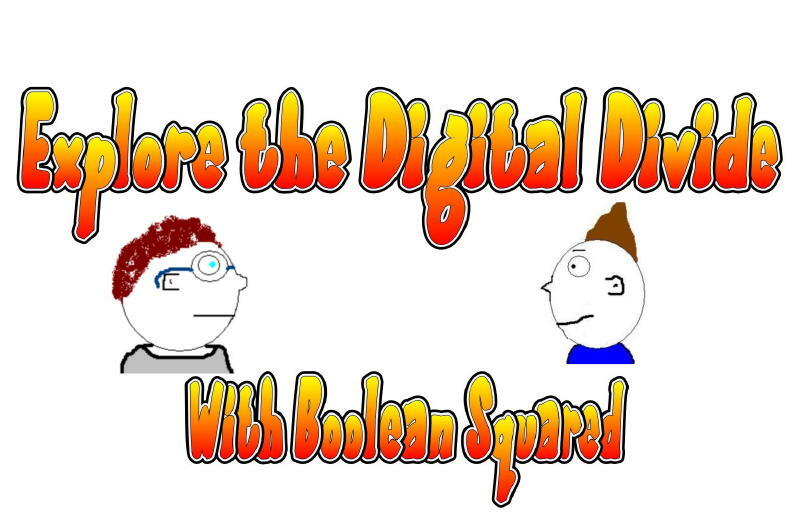 PS — speaking of comics, my latest Boolean Squared ran and it is poking fun at digital immigrants/natives. See the comic. I am experimenting with a site called Xtranormal to see what it is all about. It’s a movie-making site in which you choose a character, type the dialogue and then have some controls over the movie screen, including the scenery, music and movements of characters. Essentially, though, the site takes your words and puts them into the mouth of one or two avatars that you choose. It’s a bit disorientating, to be honest, but neat fun. You can then export the movie into YouTube or keep it at the site. It seems like it is all free for now, but there are hints that they will move to a pay-per-movie model at some point, so I am not sure if it is viable for the classroom. I am working on one for the call for Year in a Sentence, just for something different. A little movie from my digital camera as my boys and I walk a visiting dog to the river. 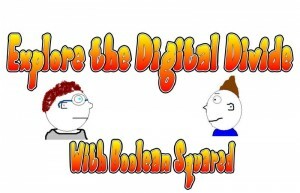 Sue Waters (whose Edublogger site is a must-read, I think) has put together a great wiki site around the concept of the Web 2.0-based Personal Learning Community. Using the results of a survey from folks in her PLC, she established a one-stop resource for folks thinking of dipping their toes into the, eh, waters. Ideally, a supportive PLC will help guide you along in your reflective stance as an educator, writer, explorer and then provide the framework for you to be a mentor to others. Also, a good PLC provides some guiding questions about your journey: where are you going and why are you going there and what are the outcomes. Start slowly and find mentor(s) to help you. Life long learning is the key! So, get your network connected! Head to Sue’s wiki for more information. I try to regularly submit reviews of picture books over at Just One Book, which is a fantastic site for learning about the art and literature of picture books. They recently published an audio review I did on the book, The Man Who Walked Between the Towers by Mordicai Gerstein. 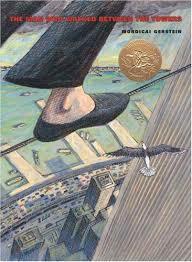 It’s a fantastic read about Philippe Petit’s daring escapade between the Twin Towers that no longer stand (after 9-11). Here is my podcast review of this wonderful story. (And here is a link to my collection of graphic novel and picture book reviews, if you are interested). In the Pageant, some folks with local connections but historical roles were sung about — including Sojourner Truth (the strong black woman who lived in a part of the town for some time); Lewis Tappan, who helped make sure the slaves from the Amistad ship had freedom after they landed in Connecticut; and Jonathan Edwards, famed leader of the religious revivalist movement who preached at the same church where we now go — and my song was sung towards the end of the Pageant. I had my father use my voice recorder to capture the songs, since I had been asked to play guitar on the songs. The song seemed to call for some sort of video, so I went and did that, too. Here is my song, All Join Hands, with the kids chorus. 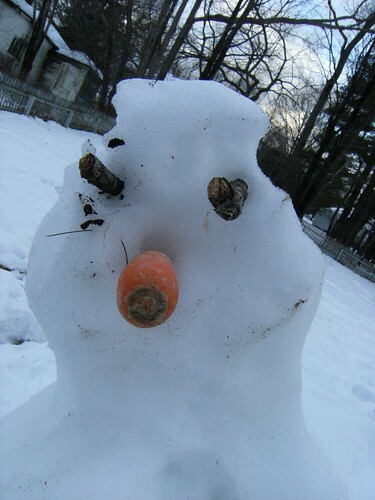 In the days leading up to Christmas, we had substantial snow (and then, sleet, and then, rain) and the conditions were ripe for building a snowman. 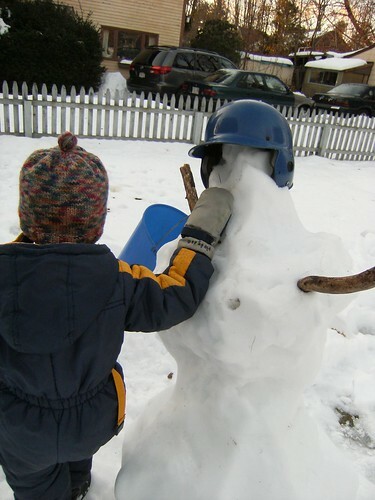 So, my youngest son and I went out and built a good-sized snowdude, put a baseball helmet on him and added a bucket for collecting snowball. I should have taken a picture right then and there, but I forgot. 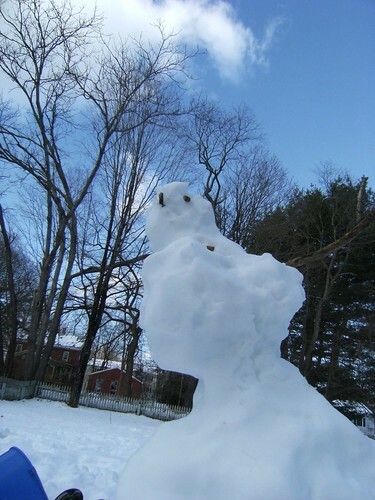 On day two, the weather turned warm and the snowman began to … droop. Here are some pictures that are part of the PhotoFriday collective (you can join in, too). Today … might be another rebuilding day. In between some creative sessions in which my sons were creating stop-motion movies, I grabbed a moment to make my own holiday short. It’s called “All I Want is a Saxophone” and I grabbed an ornament off our Christmas tree for a prop. Happy Holidays to all of my readers and may you find peace and love with your family and friends.